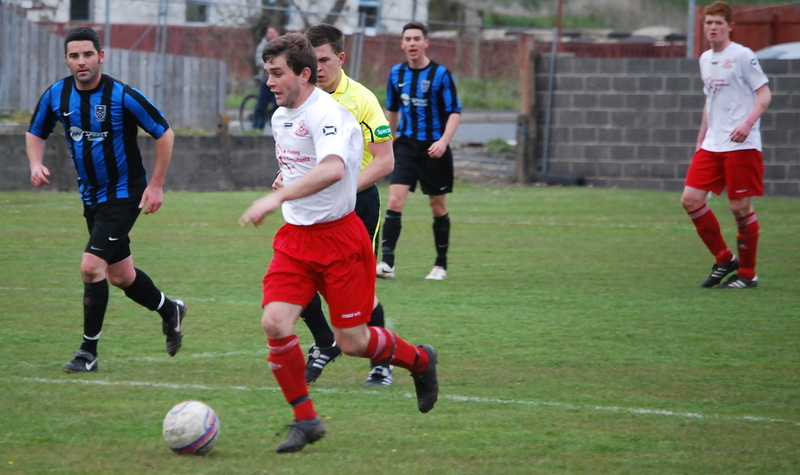 Glenafton suffered another semi-final set back at Loch Park as Ayrshire District side Troon ended their run in the Ayrshire Weekly Press Cup. In stark contrast to the recent defeat to Irvine Meadow in the West of Scotland Cup where the Glens had the Premier side on the ropes for a spell, it was Troon that were always in the driving seat until a late strike by the home side ignited hopes of salvaging a penalty shoot-out. Ian Cashmore partnered Gareth Campbell up front for Glenafton as Gareth Armstrong , John Dempster and John Paul Boyle, all recovering from recent injuries, took their place on the bench, while Craig McEwan replaced the rested Craig Menzies. 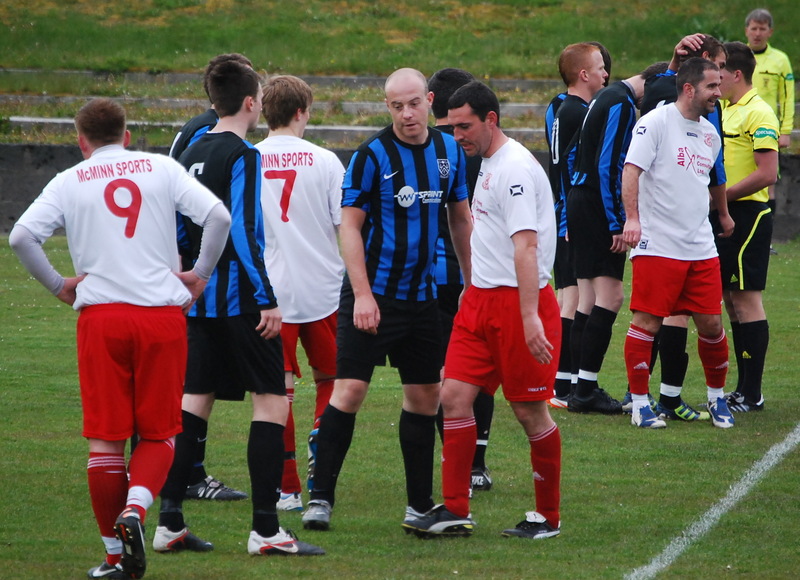 No fewer than five former Glens’ players – Martin Ure, Johnny Baillie, Cameron, McKinnell, Dougie Ramsay and Tony Murphy – formed the Troon starting eleven and were joined by Dale Moore, former Glenafton Boys Club star. The home side were first to show with a neat passage of play which saw Gus Cochrane beat Ramsay to the ball and evade the challenge of Scott Chatham before feeding the ball to Paul McKenzie wide on the right who fired in a first-time cross for Campbell on the six yard box only for McKinnell to come out on top of the aerial battle for the ball. The defender was less fortunate later when the two players challenged for the ball which earned Campbell a yellow card and resulted in the Troon man being unable to shake off the injury and was replaced by Dean Keenan with 17 minutes gone. By this time the promising start by Glenafton was a distant memory as they struggled to keep a hold of the ball and too often surrendered possession with high balls up the middle which were mopped up with ease by Baillie. Troon too struggled to create any clear cut chances but their play from box to box was much more inventive and Martin Ure was more often than not the instigator with crisp passing at pace as he broke down the right flank time and again. Little surprise then that he played a significant part in the visitors opening goal. On the half-hour mark Baille blasted a free kick from deep in his own half straight up the middle, Stevie Wilson out-jumped Ryan McChesney to head flick the ball to the edge of the box where Darren Baird saw off the challenge of Robbie Henderson before exquisitely squaring the ball to Ure who quickly returned the ball back from where it came and although it was behind Baird the incoming Wilson met it perfectly to slam the ball home. 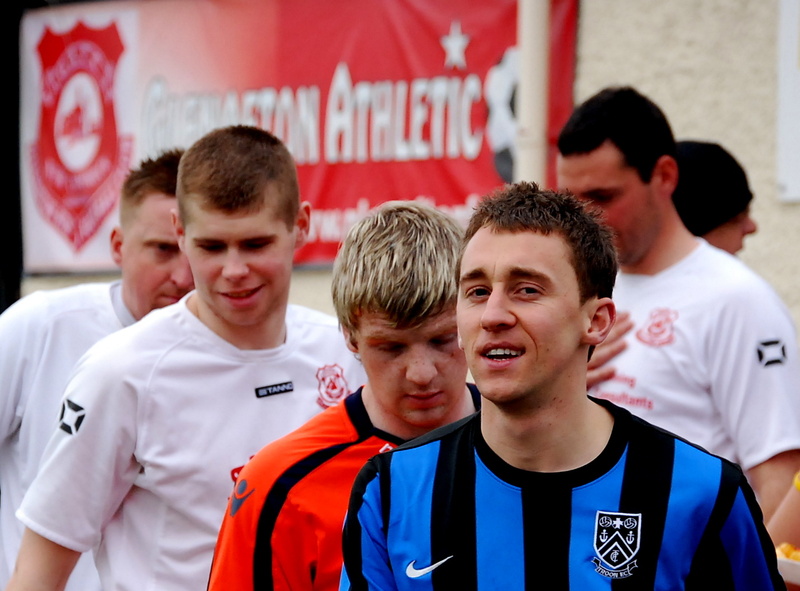 John Paul Boyle replaced Ian Cashmore at the break and made an immediate impact as the Troon box became the busier of two – for a time at least. 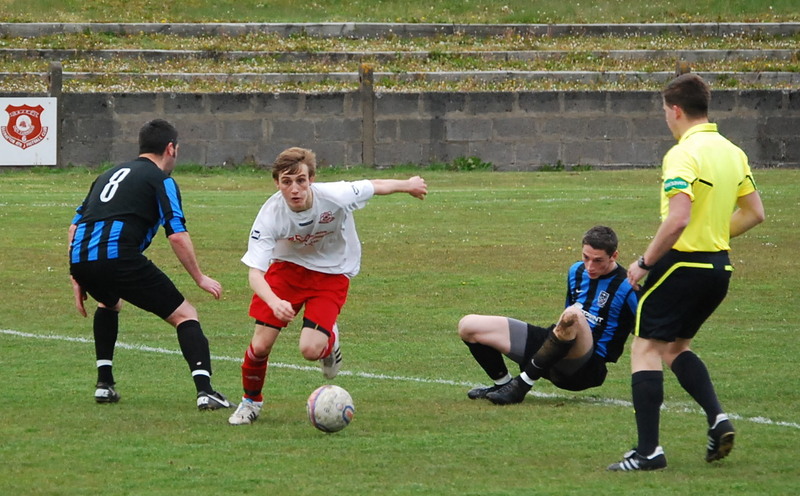 On 50 minutes a Boyle volley from 12 yards out had Fraser stretching to ensure the ball was going ball over the bar, while five minutes later the keeper was left grounded as Boyle appeared to have levelled the scores. A quickly taken free kick from the edge of the box by Campbell was rolled to Paul Murphy who cut the ball across of the face of the goal for the incoming Boyle to tap in, but the assistant referee’s flag was raised in a flash and the goal disallowed. The Glens continued to press and with half an hour to go brought on top goalscorer Gareth Armstrong for McKenzie and five minutes after that John Dempster for Cochrane. The visitors however were still menacingly dangerous on the break and on seventy minutes Semple pulled off a great save from Moore and soon after he doubled-team with McEwan to prevent Wilson from bagging his brace. At the other end Fraser tipped a Boyle drive over the bar but could only look on as McChesney’s header from the resultant corner cannoned off Tony Murphy’s head and the ball sneak inches wide of the post. Back upfield and again a McEwan last ditch tackle, Baird the aggressor on this occasion, kept Troon at bay. On 78 minutes however the striker’s efforts were rewarded. The home defence had several attempts to clear an incoming free kick before Chatham headed the ball back into the box for Wilson to flick out to the left where Baillie beat off Henderson to shoot for goal only for a stunning save from Semple to push the ball onto the bar and Baird to storm in and crash the ball into the net. Troon: Fraser, Ure, McKinnell, Baillie, Moore; Chatham, Ramsay, Cairns, Murphy; Baird, Wilson. Subs Smith, McKay, Keenan, Roy, Lyle, Leavy. This entry was posted in GAFC Match Report and tagged Ayrshire Weekly Press Cup, Glenafton Athletic, New Cumnock, Scottish Junior Football, Troon. Bookmark the permalink.